The Ajanta and Ellora Caves are perhaps the most visited caves in India. Here is a complete guide to these caves that boast of history and architecture dedicated to Hinduism, Jainism and Buddhism. Aurangabad is the nearest centre to connect you to Ajanta and Ellora caves. Aurangabad is 99 km from Ajanta and 30 km from Ellora. The caves are around 400 km from Mumbai. 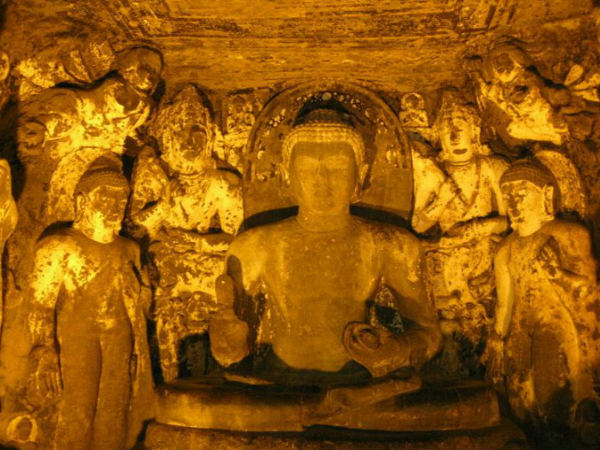 Ajanta is a cluster of 20 caves that depict the different phases of Lord Buddha's life. Each cave among the 29 caves narrate a different story. For more details into each cave, click here. Ellora is a group of 34 caves that include caves belonging to the Buddhist Group, Hindu Group and the Jain Group. From Cave1 to Cave12 they are the Buddhist group of caves. The Cave12 is also the largest monastery in Maharashtra. The Brahmanical Group of Caves are popularly called as the Hindu caves. These are from Cave13 to Cave 29. Cave30 to Cave34 belong to the Jain Group of Caves. Cave30 resembles the Cave16 of the Hindu Group of Caves. However, the architecture seen here is nowhere close to the original Hindu cave. Any time can be chosen to visit these caves, but summers are generally a bit hot when compared to the other seasons. Ajanta and Ellora caves are one of the top 10 destinations to be visited in India. The caves are open to visitors from 9am to sunset. They are also open on all national holidays and are generally found over-crowded on these days. The Ajanta caves are closed on Mondays and the Ellora caves are closed on Tuesdays.